Check the disadvantages of arrays in below article. We have some disadvantages of arrays like arrays are fixed in length. and we need to mention size of the array while creation itself. So we have some advantages of arraylist when compared to arrays in java. Here the major advantages of arraylist over arrays. One of the major benefit of arraylist is it is dynamic in size. we can increase as well as decrease size of the arraylist dynamically. 2.Default initial capacity is 10. One of the major benefit of arraylist is by default it will assign default size as 10. Whenever we create object of ArrayList constructor of ArrayList assign default capacity as 10. Another advantage of ArrayList is it can add and remove elements at particular position. Program #2: Java example program to explain the advantages of ArrayList:Add and remove elements at particular position. 4.Add any type of data into ArrayList. We can add different type of objects in to the ArrayList. In this scenario avoid mentioning generics while declaring ArrayList. Program #3: Java example program to explain the advantages of ArrayList: Add any type of Object. We can traverse both direction using List Iterator. Program #4: Java example program to explain the advantages of ArrayList: Traverse in both directions. 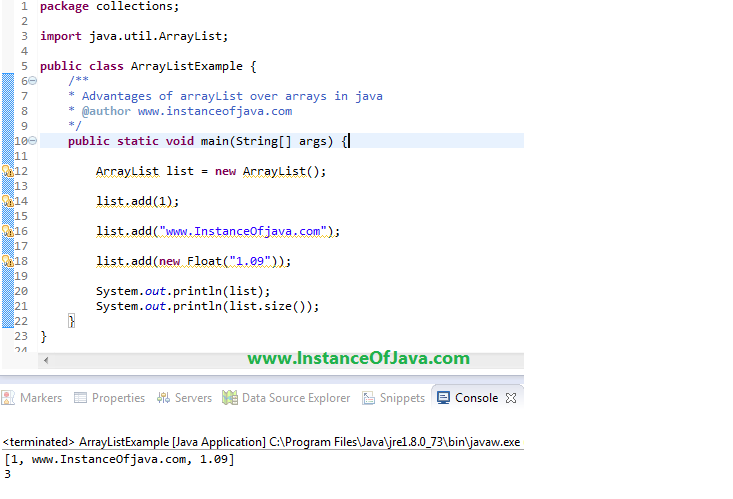 Program #6: Java example program to explain the advantages of ArrayList: Add any type of Object. 8.ArrayList has many methods to manipulate stored objects. ArrayList has many methods to manipulate stored objects.